Tomorrow at 8:00 PM in Japan (3:00 AM in America), Nintendo is going to announce a new game through Nintendo Direct, their online broadcasting service that is like a TV channel. Satoru Iwata, president of Nintendo, will announce it. Nintendo rarely announces new games through this medium, so this can definitely be considered a special occasion. While there is absolutely nothing that states this announcement will pertain to a new Pokemon title, based on all the evidence that has been building up over this past month regarding a Black and White sequel and Kyurem forme, it’s certainly possible that this is where it will first be introduced. After all, Junichi Masuda said to watch Pokemon Smash this Sunday, implying there would be information on a Black and White sequel, so if a new Pokemon game is going to be announced this week, this would definitely be Nintendo’s golden opportunity to introduce it to the world. We should also note that Sunday is the one-year anniversary of the Nintendo 3DS in Japan. If we do get a “Pokemon Gray,” it will more than likely be on the 3DS, and will more than likely boost the system’s (less than enthusiastic) sales. However, don’t hold your breath just yet – none of this is for sure and we may be looking too deeply into things. We will let you know what happens tomorrow at 3:00 AM, though, so be sure to check back! Thanks goes to Kat of AAPF for the heads up on this news story. Junichi Masuda just appeared on Pokemon Smash and announced Pokemon Black 2 and Pokemon White 2, the sequels of Black and White. Both games will be released for the Nintendo DS in June 2012 but will apparently sport additional DSi and 3DS features. 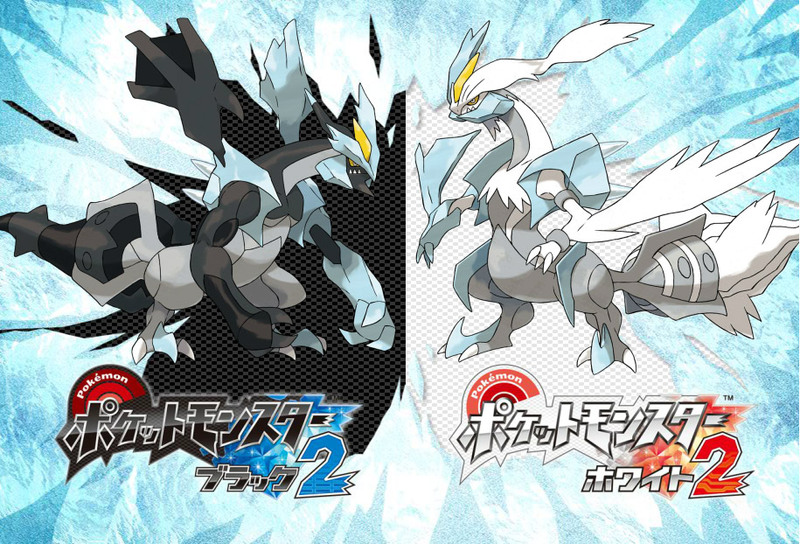 The game mascots will be the two new formes of Kyurem that were shown in the movie poster earlier: their names are "Black Kyurem" and "White Kyurem." They seem to be some sort of combination of Kyurem and Reshiram (Ice / Fire?) and Kyurem and Zekrom (Ice / Electric?). Maar wat denken jullie wat het wordt. Hoop van 1 kant dat het pokemon Gray is en dat het voor de 3DS is gemaakt. Wat hoop je van de andere kant dan? Als je mij een god vind, ga dan maar snel een bril kopen. "It's nice to be important, but it's more important to be nice"
of te wel rond morgen middag tussen 12 of 1 uur kan je het live volgen. via de link die Quote staat. Eigenlijk denk ik RSE remake. Ik geloof dat het om 12 uur is. RSE remake of Gray, beiden chill... maar doe alsjeblieft niet alleen voor de 3ds. You're sitting up, you're in our bed, crying for a ghost again. Is het niet die cross-over tussen Pokémon en nog zo'n ander Japans spel? Had'k wat over gelezen en een trailer van gezien. Life is a perception of your own reality. Ik denk persoonlijk niet dat het voor de 3DS wordt, ze hebben er IMO meer voordeel aan als het een gewoon DS-spel wordt, maar met extra 3DS opties. Voordeel voor iedereen. En?? wat is het geworden? Misschien dat er meer Pokemon nieuws komt op de E3 dit jaar ? Alle tijden zijn GMT +1. Het is nu 04:48.